Will you let this be the light in your life? If you want to turn your living space into a smart home, an increasing arsenal of options exists for you to choose from. Looking to join this packed crowd is Beacon. 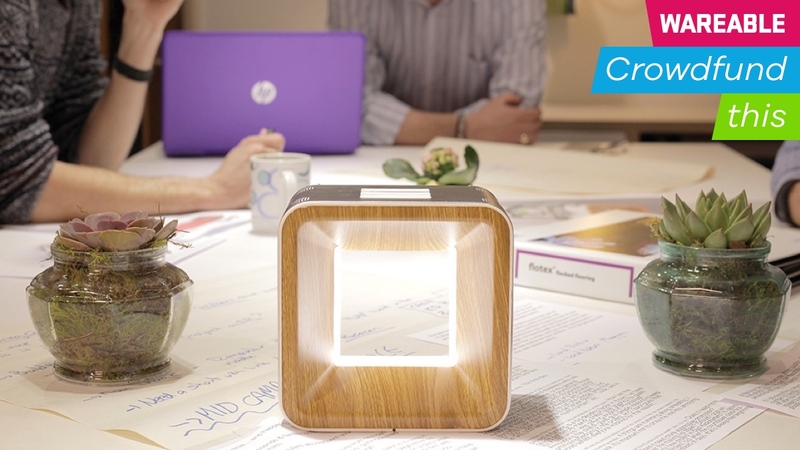 On Kickstarter for $199 from today, it aims to use ambient lighting and indoor air quality monitoring to improve your wellbeing, another step towards a home that looks after us. The multi-sensory cube focuses on these two features. We spoke to founder and CEO Kingsley Hull to find out why UK-based startup Beacon is getting into this niche area and why it could be an important addition to your home. "We had a look and saw some great new technology starting to emerge around bio-rhythmic lighting, especially in the LED space by mixing different colours of lights together, to help people specifically from a medical and wellbeing perspective," said Hull, whose background is in commercial lighting and IT. "But this also drives things like productivity and happiness. Not getting enough natural light does have a psychological and physiological effect on us. So we were looking at it and we came up with the idea that all this great tech would be suited to the home environment." The Beacon is firstly a bio-rhythmic smart light which aims to replace the ding of your alarm clock by replicating natural sunlight, with options to create custom modes for different activities. This is an area that the team has spent a lot of time researching. "It's a fact that bio-rhythmic light impacts us. There's quite a lot of scientific research behind how lighting does impact us from a wavelength and biological clock perspective," Hull told us. "The retinal ganglion cell in our eye has been found to be completely responsible for setting our internal body clocks. "And it doesn't matter whether we're blind or whether we can still see, our eyes are still impacted. It's also responsible for most of our hormonal production — two main ones being cortisol, our stress hormone, and melatonin, our sleep regulatory hormone." But what if you're content with your sleeping pattern and nightly routine — can the Beacon still bring something useful to your home? Well, as hinted earlier, the cube can also continually monitor a room's environment to help you keep track of air quality — a hot topic since London joined other cities around the world found to have high pollution levels. "There's [outdoor] pollution in the air that's killing us," said Beacon's founder, "but what I think people forget is that our indoor environments is ten times more polluted than outdoors. So while it's important for the Mayor of London and cities to focus on air pollution, at the same time our indoor air quality has been a hidden killer. "It's an area I think people are starting to wake up to. We've seen companies that are taking this a lot more seriously but where my family sleeps at night is probably more important to me than the office environment. Through about 500 studies, it's been found that 60 - 70% of indoor air quality is through poor ventilation." So how does it work? In the likely event the Beacon finds something that can be rectified in the indoor environment, a notification light will trigger on the device itself. If the temperature is too high, for example, this will flash red. And while this allows you to get a status update without looking at your phone, recommendations can also be sent to your device to help you act on the air. "Beacon is not an air purification tool, but what it would do is potentially provide you with an output to switch on a device and begin purifying the air. Making sure we monitor the core elements that are responsible for your home wellbeing — are your Co2 levels too high? Is the temperature too high? Is the humidity too low? — is a really simple thing that, without it being scary technology, we can all act upon," explained Hull. Beacon is already a working prototype, with the Kickstarter campaign looking to raise £60,000 to take it into production. And while this is obviously a device that will appeal to those looking for an air monitor or ambient light system, or both, it's also important to factor in the secondary features, such as the in-built sound and Bluetooth/Wi-Fi connectivity for music streaming. With Hull noting that the device is also future-proofed with potential integration with other smart home devices after its carefully planned March 2018 shipment date, this project appears as solid as crowdfunding campaigns come. Though as we all know, nothing being guaranteed in this bubble. For those interested in a wellness focused smart home device, early bird offers begin at $199, which is a fairly sizeable chunk off its eventual expected retail price of around $360.